For Hal, now, this summer is different. Sure he’s spending it, as always, with his family at their cottage on the wild west coast of England. But this summer he meets Jackie, beautiful, impetuous Jackie. Lying with her on the beach while she sculpts mermaids from wet sand–it’s paradise. Or would be, if only he didn’t keep hearing the desperate pleas of his lost sister Charley in his head . . .
For Charley, then, last summer was different. Pete, the impossibly gorgeous surf god, wanted her, she couldn’t believe it! To lick the sand off his lips, to let the sun tan the outline of her hand over his heart–she’d do anything to be with him. Even if it meant sneaking out and leaving her tagalong brother Hal behind. Just for one night. How could she have known what would happen by dawn? 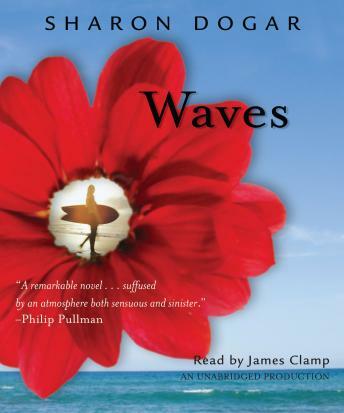 Set at a beach where growing up goes wrong, Waves is a coming-of-age mystery about first love and tragic loss. About a family drowning in sorrow, and the courageous son struggling against the tide to save them.